WOMAN HAD one fair daughter, who loved play better than work, wandering in the meadows and lanes better than the spinning-wheel and distaff. The mother was heartily vexed at this, for in those days no lassie had any chance of a good husband unless she was an industrious spinster. So she coaxed, threatened, even beat her daughter, but all to no purpose; the girl remained what her mother called her, "an idle cuttie." At last, one spring morning, the gudewife gave her seven heads of lint, saying she would take no excuse; they must be returned in three days spun into yarn. The girl saw her mother was in earnest, so she plied her distaff as well as she could; but her hands were all untaught, and by the evening of the second day only a very small part of her task was done. She cried herself to sleep that night, and in the morning, throwing aside her work in despair, she strolled out into the fields, all sparkling with dew. At last she reached a knoll, at whose feet ran a little burn, shaded with woodbine and wild roses; and there she sat down, burying her face in her hands. When she looked up, she was surprised to see by the margin of the stream an old woman, quite unknown to her, drawing out the thread as she basked in the sun. There was nothing very remarkable in her appearance, except the length and thickness of her lips, only she was seated on a self-bored stone. The girl rose, went to the good dame, and gave her a friendly greeting, but could not help inquiring "What makes you so long lipped?" "Spinning thread, my hinnie," said the old woman, pleased with her. "I wet my fingers with my lips, as I draw the thread from the distaff." "Ah!" said the girl, "I should be spinning too, but it's all to no purpose. I shall ne'er do my task:" on which the old woman proposed to do it for her. Overjoyed, the maiden ran to fetch her lint, and placed it in her new friend's hand, asking where she should call for the yarn in the evening; but she received no reply; the old woman passed away from her among the trees and bushes. The girl, much bewildered, wandered about a little, sat down to rest, and finally fell asleep by the little knoll. When she awoke she was surprised to find that it was evening. Causleen, the evening star, was beaming with silvery light, soon to be lost in the moon's splendour. While watching these changes, the maiden was startled by the sound of an uncouth voice, which seemed to issue from below the self-bored stone, close beside her. She laid her ear to the stone and heard the words: "Hurry up, Scantlie Mab, for I've promised the yarn and Habetrot always keeps her promise." 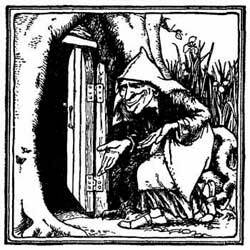 Then looking down the hole saw her friend, the old dame, walking backwards and forwards in a deep cavern among a group of spinsters all seated on colludie stones, and busy with distaff and spindle. An ugly company they were, with lips more or less disfigured, like old Habetrot's. Another of the sisterhood, who sat in a distant corner reeling the yarn, was marked, in addition, by grey eyes, which seemed starting from her head, and a long hooked nose. While the girl was still watching, she heard Habetrot address this dame by the name of Scantlie Mab, and say, "Bundle up the yarn, it is time the young lassie should give it to her mother." Delighted to hear this, the girl got up and returned homewards. Habetrot soon overtook her, and placed the yarn in her hands. "Oh, what can I do for ye in return?" exclaimed she, in delight. "Nothing--nothing," replied the dame; "but dinna tell your mother who spun the yarn." before daylight; and if ye dinna believe me, why come in and see it." The laird, he alighted and went into the cottage, where he saw the yarn, and admired it so much he begged to see the spinner. The mother dragged in her girl. He vowed he was lonely without a wife, and had long been in search of one who was a good spinner. So their troth was plighted, and the wedding took place soon afterwards, though the bride was in great fear that she should not prove so clever at her spinning-wheel as he expected. But old Dame Habetrot came to her aid. "Bring your bonny bridegroom to my cell," said she to the young bride soon after her marriage; "he shall see what comes o' spinning, and never will he tie you to the spinning-wheel." Are both rank and foul to see? The song ended, Scantlie Mab asked Habetrot what she meant by the last line, "Unseen by all but we alone." "There is one," replied Habetrot, "whom I bid to come here at this hour, and he has heard my song through the self-bored stone." So saying she rose, opened another door, which was concealed by the roots of an old tree, and invited the pair to come in and see her family. The laird was astonished at the weird-looking company, as he well might be, and inquired of one after another the cause of their strange lips. In a different tone of voice, and with a different twist of the mouth, each answered that it was occasioned by spinning. At least they tried to say so, but one grunted out "Nakasind," and another "Owkasa�nd," while a third murmured "O-a-a-send." All, however, made the bridegroom understand what was the cause of their ugliness; while Habetrot slily hinted that if his wife were allowed to spin, her pretty lips would grow out of shape too, and her pretty face get an ugsome look. So before he left the cave he vowed that his little wife should never touch a spinning-wheel, and he kept his word. She used to wander in the meadows by his side, or ride behind him over the hills, but all the flax grown on his land was sent to old Habetrot to be converted into yarn.